32-year-old Julia Römer is the CEO of Coolar UG and one of the few female founders in the technology sector. Since 2012, she and her team have been developing refrigerators, which run without electricity, have no CO2 emissions and save utility costs. The start-up Coolar has specialised in medical refrigerators for vaccines, which are mainly being used in Asia and Africa. The company is currently working on the next prototype, which will be field-tested soon. “Until now, we have financed ourselves with grants and start-up funding. 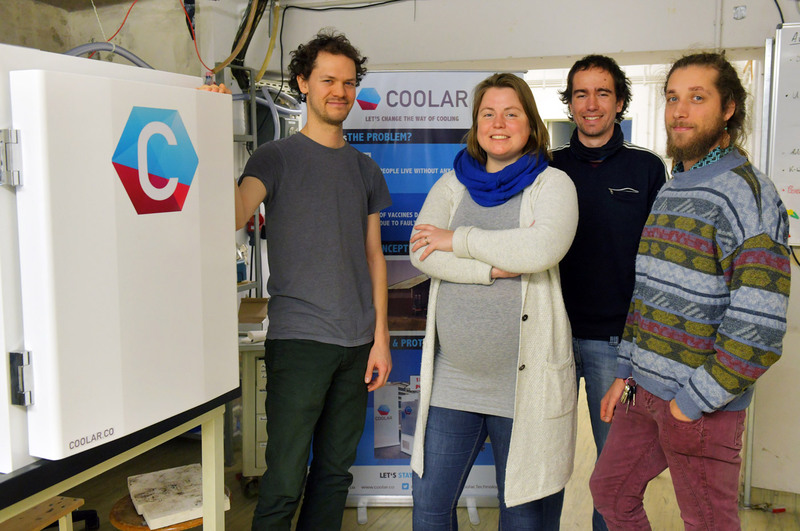 Now that we have applied for patents and produced prototypes, we are able to grow a little more,” says Coolar’s CEO, Julia Römer. She founded a business in a male-dominated field. She comes from a family of engineers: “It was completely natural for me to think that I could do this, too.” She started studying chemistry for almost two semesters at Berlin’s Humboldt-Universität (HU) in Adlershof before she switched to engineering management at the Technical University Berlin (TU). She has a very natural and lively way of speaking and a down-to-earth demeanour. Her style evokes images of a skier, who dashes down a mountain and confidently leans into the curves. Incidentally, this is something she also does as a ski instructor. In the opinion of her male colleagues, Julia Römer is a persuasive and inspirational individual. She can be stubborn at times, but that is also good thing: “It can be a bit strange being the only woman among all these men. I met all these great women at university, but when it comes to founding a company, they disappear. I sit there asking myself where they could be.” Based on these experiences, the CEO of Coolar got involved with women’s networks. Female founders stick together because they have similar concerns: “It starts with relatively banal issues: what do I wear in a room full of men? A skirt or a suit? Do I adjust to the room or do I want to feel feminine?” The 32-year-old has decided that she feels good, when she stays true to who she is. The off-grid refrigerator was also the topic of her master’s thesis. The business founders and their supporters work in close cooperation with the TU and so Coolar’s headquarters is at the Charlottenburg Innovation Centre CHIC. Their workshop is located in a TU building just 500 metres down the road. In the future, Coolar aims at merging workshop and offices in one place. Adlershof is a promising option: “When I was still studying there, things were very different. It’s crazy what happened here in the meantime. I can hardly keep up with all the companies that have since moved to the high-tech site. I’m convinced that we will quickly find partners for cooperation. We are looking for partners for cold welding, for example. CEO Römer and her four co-founders have already sent off an inquiry for a space in the Technology Park Adlershof.